At the beginning of the game, Zuo Ci draws two unused character cards. These Forms are placed face down. He then selects one ability from one of these and leaves the Form face up. Zuo Ci cannot use a king ability, single-use ability, or awakening ability. Zuo Ci acquires this ability along with the allegiance and gender of his Form. At the beginning and end of every turn, he can choose a new ability from any of his Forms. For every unit of damage that Zuo Ci receives, he acquires another Form. The switching of Forms in "Incarnation" happens at the very beginning and the very ending of each of Zuo Ci's turn. This switching occurs before a selected ability would occur. For example, Zuo Ci's switching of Forms happens before "Star Gazing" would if one of his Forms was Zhuge Liang. Be sure to note that while Zuo Ci can have many Forms, he can only have one power active at a time. If Zuo Ci is flipped face down, he cannot switch Forms on the turn in which he flips back face up. Instead, he must wait until his next normal turn. Zuo Ci only shows one Form face up at a time. The other forms are kept face down and the other characters will not know their identities until Zuo Ci uses them. Note that "New Life" is activated on a 'per-damage' basis. In other words, if Zuo Ci takes multiple units of damage in one instance (such as being hit with an Attack with Wine), he will receive a number of forms equal to the number of units of damage taken. Zuo Ci is a lot of fun to use. There are so many possibilities with him and one can almost guarantee that no two games will be the same if they choose this character. Because Zuo Ci gains new Forms each time he is damaged, he gets new options and abilities as the game goes on. Some characters have abilities with weaknesses. If Zuo Ci has one of these characters as one of his Forms, he may be able to mitigate this weakness by strategically switching Forms at the right time. While Zuo Ci can have many options, he can sometimes be very unlucky with his picks. With only three units of health, he does not have a lot of leeway to succeed with sub-par powers. Some characters with four units of health have powers that do not work will with a character of three units of health. If Zuo Ci has these characters as Forms, he will be at somewhat of a disadvantage when trying to use these powers. Some characters have two abilities that work very well with each other. Because Zuo Ci can only use one power from one Form at a time, he cannot use these characters effectively. Some characters' most powerful abilities are single-use abilities or awakened abilities. Because Zuo Ci cannot uses these abilities, Forms with these types of powers will not be useful to Zuo Ci. Zhang Chun Hua - Zhang Chun Hua's "Unfeeling" bypasses Zuo Ci's "New Life," robbing him of one of his most powerful advantages. Because Zuo Ci is so erratic with his character choices, his 'Notable Combinations' section is somewhat lackluster. As a result, this section is included for Zuo Ci to give you some examples of Forms that are useful for Zuo Ci and examples of Forms are less powerful for him. Hua Tuo - Hua Tuo is probably Zuo Ci's best form. "Green Vesicle" and "First Aid" are useful to Zuo Ci because they can help keep him alive as he takes damage to acquire new forms. Also, these two powers are activated at different times ("Green Vesicle" during his turn and "First Aid" outside of his turn), so the 'one power at a time' weakness is bypassed. Zhen Ji - Like Hua Tuo, Zhen Ji has two powerful abilities that are activated at different times. 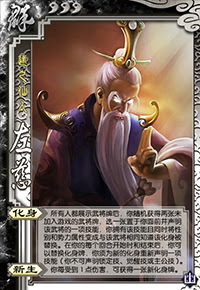 Xu Shu - Xu Shu's "Speechless" provides Zuo Ci with a powerful defense against tool cards. Because Zuo Ci changes forms at the beginning and end of his turn, he can turn this power off during his turn so he can effectively use tool cards during his turn and protect himself outside of his turn. 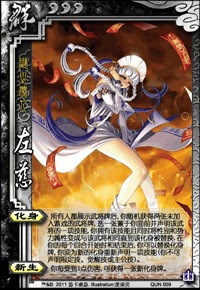 Xiao Qiao - Xiao Qiao's two abilities are very powerful together, as she can discard heart-suited cards for "Fantasy" and "Beauty" turns spades into hearts. However, Zuo Ci can only use one of these powers at a time. If he chooses "Fantasy," he is not nearly as powerful as Xiao Qiao because he can only use 1/4 of the deck (hearts) to pass damage instead of 1/2 of the deck (spades and hearts). Zhang Jiao - Like Xiao Qiao, Zhang Jiao's two abilities work very well together. "Lightning Strike" allows him to force a character to flip a judgement card to possible receive two units of lightning damage, while "Dark Magic" allows him to tinker with this flipped judgement. Because Zuo Ci can only use one of these powers at a time, he is a lot less powerful than the original Zhang Jiao. Meng Huo - Meng Huo's "Resurgence" is helpful as it allows him to flip over as many cards as he is missing health. Because Meng Huo has four units of health, this power is very powerful when he starts his turn with only one unit of health remaining, as he flips over three cards. If Zuo Ci the same situation when trying to use this ability, he will only flip over two cards, as he only has a maximum of three units of health. The 'Role Analysis' section for Zuo Ci was omitted because Zuo Ci's competency at handling these roles is strongly dependent upon the Forms he has acquired. Zuo Ci has the potential to handle each role incredibly well with the right Forms, but if he has weak Forms, he could potentially fall flat on his face. Because Zuo Ci is so complicated, it is difficult to preemptively answer all of your questions about him. If you have any questions, feel free to put them in the comments below. In any event, it is probably clear to you that Zuo Ci is dependent upon luck to work well. Do not let this stop you from using him. He is a lot of fun to use!